Bramah 18 slide safe lock. Thread: Bramah 18 slide safe lock. 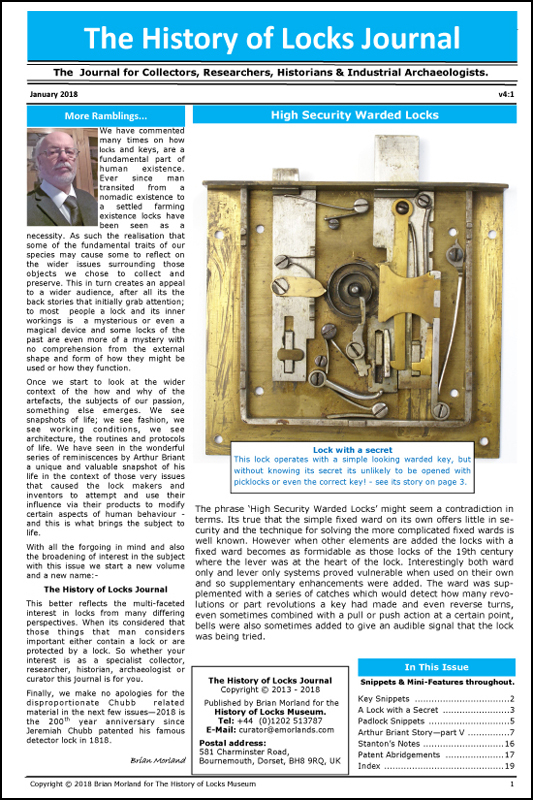 This lock is an example of the Bramah mechanism in it's ultimate form, normal Bramah locks had no more than 7 or 8 slides, top quality safe locks might have as many as 13. The Bramah challenge padlock (now in the Science Museum - London), the original exhibition lock (in the possession of Bramah's) and this example all have 18 slides. NB The Challenge padlock, while originally 18 slides was rebuilt after it was picked and is now a 13 slide lock. Such locks must have only been made for exhibition or display purposes, because the sheer number of slides produces a huge & impractical key. And for the most impressive view of all, the key bit - end on. To appreciate the size of the key, the diameter is (from memory) approximately 20 mm. Note : Although, as stated above this lock is not mine, or included with the knowledge / consent of it's owner these images are and will remain © copyright Paul A Prescott 2003. I remember seeing a drawing of Bramah's first? lock design that was similar to several 1850's US lever push key locks where the lever bellies are facing out. I think it had 6 levers three on each side of the key post. Have any of these ever turned up? That was just a concept drawing / prototype showing the principle on the flat surface rather than a round key, It was never commercially produced by Bramah.